In February 2014, David Schumm and his wife were arguing in their home when she tried to place a 911 call. His wife testified that he prevented her from making the call by taking her cell phone. Fearing an assault, she ran outside, screaming for help. Schumm allegedly followed her outside, dragged her onto their porch and “strangled” her. At trial, Schumm denied all assaultive conduct and denied taking her cell phone. Schumm was charged in two separate cases with Interference with 911 Call and with Assault Family Violence with Impeding Breath. Tex. Penal Code Ann. § 42.062 and § 22.01(b)(2)(B) (West Supp. 2015). Schumm was acquitted of the felony assault charge at trial. At a separate trial for the Interference with a 911 Call charge, the jury was allowed to hear that Schumm had been accused and tried for felony assault, however, the jury was not allowed to hear that he had been acquitted of the charge. Schumm’s attorney attempted to get a certified judgment of acquittal admitted into evidence, but the State’s relevance objection was upheld—the trial court prevented Schumm from disclosing to the jury his acquittal. Schumm appealed his conviction for Interference with a 911 Call on the ground that the trial court abused its discretion by excluding the evidence of the felony assault acquittal. Read the court’s opinion in Schumm v. State. Under Texas Law, to be found guilty of interfering with an emergency call an (1) individual (2) knowingly (3) prevents or interferes with (4) another individual’s (5) ability to place an emergency call or to request help, including with a cell phone (6) from a law enforcement agency, (7) in an emergency…[“a condition in which an individual is…in fear of imminent assault.”]. Tex. Penal Code Ann. § 42.062(a)-(d). Appealing to the Second Court of Appeals, Schumm argues that the excluded evidence of his acquittal is relevant to the element of “emergency” (#7 above). He contends that because he was acquitted of “intentionally, knowingly, or recklessly impeding the normal breathing” of his wife, that there was no proof that an emergency actually existed, and that, because no emergency existed, not all of the elements of “interfering with an emergency call” have been fulfilled. In short, there is reasonable doubt that an emergency existed at all because he was acquitted of the underlying assault, and, because the trial testimony is her word against his. Here, the Second Court of Appeals disagrees with Schumm, “yet the judgment of the acquittal [Schumm] sought to admit did not show that the felony jury had specifically found no emergency.” The jury did not find that Schumm’s wife was not in fear of an imminent assault at the time Schumm allegedly prevented her from using her cell phone. Instead, the felony jury found that the Schumm should be acquitted of the “assault by impeding breathing” charge. 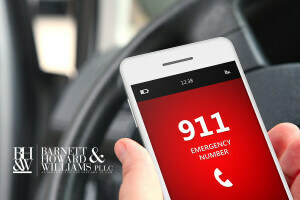 The Court notes that “emergency is not an element of assault by impeding breathing” and a “completed assault is not an element of the offense of interference with an emergency call.” Id. In short, the evidence had no bearing on whether Schumm’s wife feared an imminent assault when she tried to call 911; the Court does not address the possibility that there is reasonable doubt that an emergency existed in the first place. The Court affirms the trial court’s judgment of guilty.